Looking for art books on Kindle? Below you will find a summary of oil painting instruction books by Rachel Shirley. A multitude of subject matter are tackled in each field, be it landscape painting or still life. A diversity of oil painting techniques are also explored in depth in each book. Click on any book cover on the right to purchase a kindle art book from Amazon for just a few pounds (or dollars depending where you are), although my books are also available as print copy. Briefly I have practiced oil painting from the age of six, achieving a BA Hons in Fine Art from Kingston, Surrey, as well as a PCET teaching qualification from Warwick. I also write children's picture books, details of which can be found at the bottom. Comprehensive troubleshooting advice on painting landscapes, including issues such as painting plein air, perspective and mixing greens. Chapters including ‘my skies are bland and empty,’ ‘my greens are artificial, and ‘how do I erase a mistake from my painting?’ tackles each issue indepth. Book’s statistics: 24,000 words, over 100 colour illustrations and 20 diagrams, available as Kindle and hard copy. Comprehensive troubleshooting advice on painting still life including issues such as ellipses, perspectives and textures. ‘Why do my flowers look wishy washy?’, or ‘the food in my still life resemble plastic toys?’ are just two chapters that tackle common issues related to still life art. An introductory chapter on oil painting materials enables the beginner to embark upon still life painting with minimal fuss, mess and expense, as well as a step by step demonstration at the back. Book’s statistics: 24,000 words, over 100 colour illustrations and 20 diagrams. Available as Kindle and hard copy. This oil painting instruction book contains 20 step by step landscape painting demonstrations on various landscape scenes including a coast, a castle and a desert. With preparatory chapters, troubleshooting tips and full instructions on how each painting was completed the project is likely to yield satisfactory results. Book’s statistics: 19,000 words and 187 colour images. A guide book for art teachers offering lesson plan ideas for oil painting, including a section on a guide to oil painting materials, classroom management, learning styles and conducting assessments. The main section of the book gives lesson plan ideas for beginners, a course in still life, landscape art, plein air painting and lots of others. This book has 45,000 words and has over 100 colour images and diagrams. A must for any teacher of oil painting. Note, for those wishing to purchase a hardcopy, a colour version and a black and white version (for cheaper cost) are available. Read more about this book or purchase a signed copy from Ebay. (Hard copy only) A guide to painting the landscape, including a section on plein air painting, oil painting on a budget, and issues surrounding painting various subject matter in the landscape. This invaluable art book for landscape artists is available as hard copy only. Published by the Guild of Master Craftsman Publications (2003). Ben’s Little Big Adventure describes a small boy’s quest for a midnight snack. Only trouble is, everything in his room seems to have scaled up to the proportions of the earth’s great wonders, including the furniture and even his cat. If only Ben’s toy helicopters, cranes and hot air balloon had real engines, for they would make his quest a little easier. With so much to climb and navigate, will Ben ever find his way to his prized biscuits and jam? Print book’s statistics: 8x10in, 1000 words approx and 32 pages full of colour illustrations. This book combines the 2 Magic Teapot stories outlined below. Katie, a young girl journeys into the cosmos and beneath our oceans within her magic flying teapot. The kindle edition has in excess of 70 pages, each brimming with colour illustrations for young learners, completed in oils. A bumper treat for young children curious about the world about us. An educational picture book for children with full colour images completed in oils, Katie’s Magic Teapot and the Cosmic Pandas takes the reader into a journey through the universe to discover planets, moons, galaxies and other oddities within our cosmos. The journey takes place rather bizarrely within a magic teapot. See sample pages of Katie’s cosmic journey or purchase. Forming the sequel to Katie’s Magic Teapot and the Cosmic Pandas, this educational picture book for young children, describe Katie’s quest for treasure as she and her troupe venture in the deep oceans within Katie’s magic teapot. Along the way, Katie learns about coral reefs, oceanic mammals and creatures of the deep. But will Katie find any treasure to bring back to her mummy and daddy? See sample pages of Katie’s marine journey here or make a purchase. 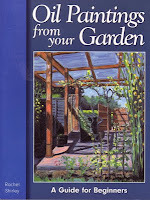 An oil painting book for beginners, this book offers comprehensive advice for artists wishing to find inspiration from their own back yard, namely the garden. The garden offers lots of great subject matter from which to paint if one looks hard enough and has the added bonus of privacy and complete control over the environment. My book offers lots of guidance on all matters relating to oil painting, including a beginners’ section, composing a painting, effective use of the light and painting flowers. Colour mixing and practical advice on painting plein air ensure the artist is able to build on confidence and improve within the comfort of the garden. Numerous step by step demonstrations including painting figures, sunflowers, a greenhouse interior and strawberries provide an informed view of how each painting was completed. Regardless of shape, size, type or time of year, every garden has something to offer, which might require but a sketch book and a keen eye. Common difficulties such as mixing greens, attaining the colour theory, setting up the painting station in the garden, and saving money on art materials enable the beginner to get to grips with all aspects of painting in the garden. There is more to the garden than one might first think including flowers, figures, pets, patios, trellises, sheds, children, tools, vegetable plots, hanging baskets, garden furniture, skylines, fish ponds or any still life setting in the garden. The interior of my book can be viewed on Googlebooks or on Amazon. Click on image to purchase a signed copy from Ebay for just a couple of pounds. Published by GMC Publications (2002) my book has 172 pages, full of colour photos, illustrations and diagrams, the book’s dimensions are 21x28cm and 1cm deep. There are 12 chapters within, covering beginner’s guide to using oil paints, where to find inspiration, completing your first painting, painting backgrounds, man-made objects, sunlight and shadow, flowers, fruit and vegetables, figures in the garden, skies and weather. Sections on making your own viewfinder, colour mixing and recommended pigments are included within.